In support of the soon to be released documentary, the Cosmic Psychos will finally be returning to stages around the country. 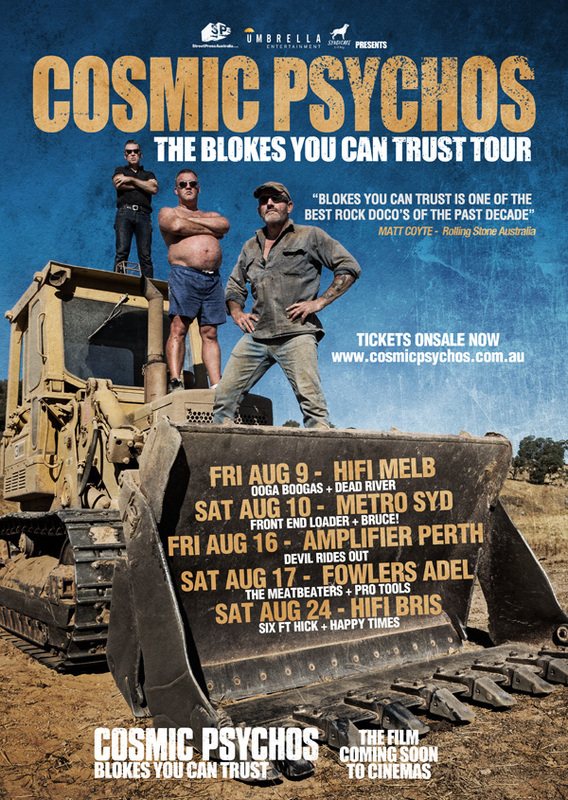 For 30 years, the Cosmic Psychos have blazed a trail of empty beer cans and busted eardrums around the globe with their quintessential Australian drawl and pounding buzzsaw punk rock songs. Iconic label SupPop released their first album when the band fell into the ‘Seattle’ scene of the late 80’s amidst the likes of Pearl Jam, Mudhoney and The Melvins. The band managed to tour heavily in the USA and Europe thanks to a large and devoted fan base. The Psychos were notorious for their ability to drink pubs dry, earning them a reputation to; “Never drink with the ‘Psychos”. The Psychos are the focus of a new documentary, Blokes You Can Trust, and early rave reviews are already emerging. Check out the trailer!